the sharing of ecological processes, such as mean annual rainfall and rain season, occurrence of frost, natural herbivores and frequency of lightening. Biomosome™ seed mixtures have been developed on BIOME principles. Correct the circumstances, pay attention to establishment and allow nature to take care of the rest. Before commencing rehabilitation it is vital to establish the cause of degradation and to take remedial action. These products are irritating to the eyes. Eye protection is advisable when handling the seed. Thoroughly mix the content of each bag immediately before planting, as components are packed separately and settle at different rates during handling and transport. Seed of most veld harvested species is characterised by the presence of straw. As this hinders the flow of seed in the planting process a spreading agent is advantageous. The seed should be blended with the spreading agent to achieve a uniform mix of seed in the material. Commonly used spreading agents are river sand, bran, finely sifted kraal manure or a mixture in equal quantity of agricultural lime and granular fertilizer. The latter has the added advantage of visibility of areas seeded. The quantity of spreading agent should be sufficient for smooth flow using the planting method selected. Typically the volume of spreading agent should be equal to the volume of seed being mixed. Mix only as much as will be required on the day of seeding in order not to damage seed in storage. The seed is packed in 5kg bags maximum. Before each planting mix the content of the bag thoroughly before taking whatever quantity is required. If more than one bag is required for a planting, separate batches per bag of seeds should be blended into spreading agent to maintain the integrity of the composition of species. In larger quantities the components will shift too much due to differences in shape, texture, size and specific gravity of the seed. Soil analysis is advisable, especially in situations where the nature of the topsoil is questionable. The results should be interpreted for amelioration, to rectify serious deficiencies and imbalances and to know what excesses there may be for future references. Soil amelioration material should be incorporated into the soil in line with established practice. Wherever possible the surface being planted should be finally cultivated to a fine tilth. On heavy compacted soil ripping and disking may have to precede surface cultivation to loosen and aerate. For small scale operations and filling patches, digging over by hand should be done so as to achieve similar results. The emphasis on aftercare is to allow nature to prevail and so permit plant succession to take place to a pleasing conclusion. Irrigation to keep the seedbed moist and assist establishment of seedlings can be beneficial. However, once established irrigation should be kept off indefinitely. 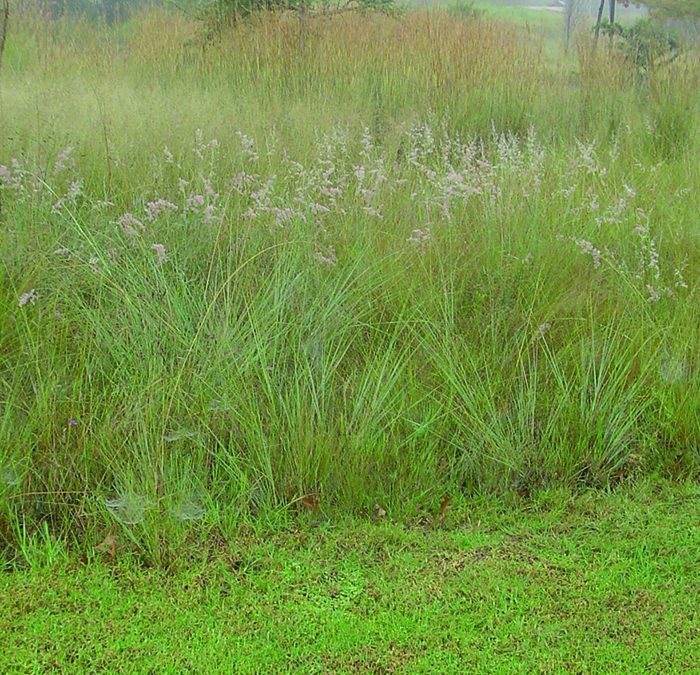 The grasses and indigenous plant succession arising from their establishment are dependent on the seasonality and quantity of natural precipitation. Irrigation water from adjacent areas must be kept off. The same applies to run-off from such areas, paved surfaces and buildings. The grasses should be left to grow to maturity, flower and shed seed in the first season. In succeeding seasons they should be cut twice or three times depending on growth. The bulk of the sward should be cut, but cutting height should not be lower than 100mm. A veld fire, weather planned or accidental, would be a substitute for a cutting. A burn every 3 to 5 years is advantageous for the veld grasses. Planned burns should be done at the end of winter and early enough to avoid damage to spring regrowth. Fertilisation after initial amelioration should be avoided other than to compensate for any removal of cut grass. If the cut grass is very thick some removal may be necessary to avoid the area becoming moribund. Regrowth by way of tillering from the crowns of the grasses depends on sunlight, but too much removal of cut grass will impact negatively on the soil. If chemical fertiliser is used it should be a complete N:P:K mixture, such as 2:3:4, rather than a lawn mixture. If the veld borders are on paved or mowed areas there is an aesthetical advantage in cutting the transitional part at least the first metre or two of veld more frequently to achieve a graded appearance. Cutting height should be kept at minimum 100mm. The effect will be to slow down the plant succession process, but this is justified in the overall outcome.